Returning to work after baby can be quite challenging. Vraiment, a bit frightening pour être honnête. You are not the same woman who left work before having a child. You don’t have the same priorities and quite frankly both your body and your emotions have been through a lot. Whatever happened during your pregnancy and the time off after, you have been through many events that you were not even imagining before! You can read all the books you want to be la maman parfaite, it’s just a learning curve that you take along. 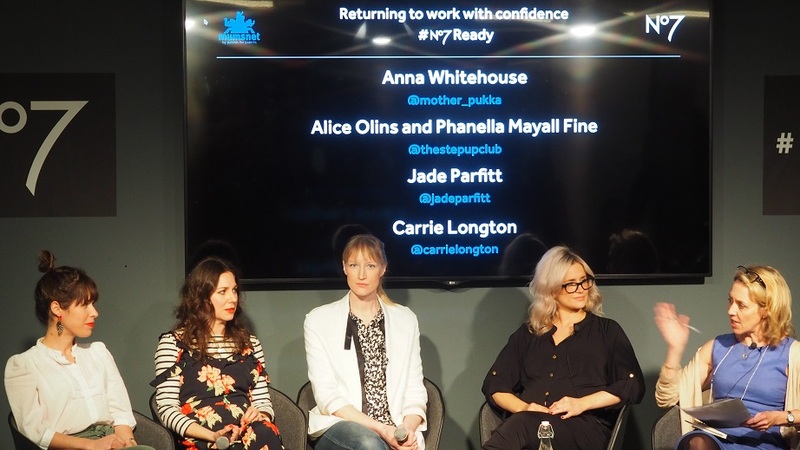 On Monday, I was lucky enough to attend a No7 Event with Mumsnet and Boots UK. Not only the night was filled with bubbles and amazing makeup, but we also listened to some fab ladies about how to return to work with confidence. Here are what I retained from the fabulous evening. All the guests, Mother Pukka, The Step Up Club, Jade Parfitt and Carrie Longton were fabulous and so inspiring. Like any other woman returning to work after a baby, I had my doubts and my fears. Mais those great dames reminded me that I was doing some great stuff. And yes, I am confident to return to work! With honesty and taking examples from their own experiences, the guests recomforted me in many ways. Here are is how to return to work with confidence. How to return to work with confidence. It’s all in here! All the participants made it very clear: whatever you decide to do, stick to it even if it’s not always easy! Mother Pukka admitted without shame that she used to judge other women that were leaving work early before she became herself a mum. I have been there. I kept it quiet but I remember thinking how lucky were the mamans in my department to be part-time. Quite frankly, I thought that they were having it easy! How wrong was I! Since becoming a mum and having to juggle with this title as well as my work (and a Frenchie blog to entertain my readers on a regular basis), I now realise how difficult it is! So yes, I am leaving work earlier than usual, but guess what? I am working from home later at night after a long day and my duties finished. It’s not easier! And I used to feel guilty to leave work before 5 pm. But I have no reason whatsoever to do so. I work as hard as other people without children. And you should feel the same if you are a mummy. Decide what you want to do, how flexible you want to be and stick to it! This is your life and you are in control of it. Whatever people think of you doesn’t matter. After all, they will even change their mind when they are in the same position as you. I have already expressed my opinion about the dream that girls run the world and we can have it all. Une grande illusion! It’s not always possible. There are times when you are tired and you can’t do it all! You already sacrificed a lot for your children: your look (at least temporary), your life, your sleep and so much more. Are you not a chef in the kitchen? Is your house not always tidy? Who cares!? You are allowed to have a break and ask for help. Being an expat I don’t have my family to support me. However, Grumpy Boyfriend has always been here when I needed him. My partner does so much. He drops Baba at the nursery so that I can start working before 7.30 am. He also picks him up as I am not always home early. Mon homme plays with le bébé a lot. He cooks for me if I am ill or I don’t feel like it. He gets up at night when le petit monstre is screaming. We share it all and I am proud of him. Because he is a good dad and he is fully involved in Baba’s education. Equally, it’s important to take some time for yourself. I have done it many times. I loved being pampered, going out in a town like I was young and beautiful… And it was good! I enjoyed it. Many of us make the mistake not to think about ourselves when it’s so important to feel good both in your body and in your mind. Being happy is not always easy, but it’s possible if you step back and let others do it for you! Whatever is your thing (having a bath, shopping, going out for a coffee with a friend), do it regularly. You are not only a mummy so why would you only do the chores and the activities around your children? Just going to the No7 Event this week was fabulous. 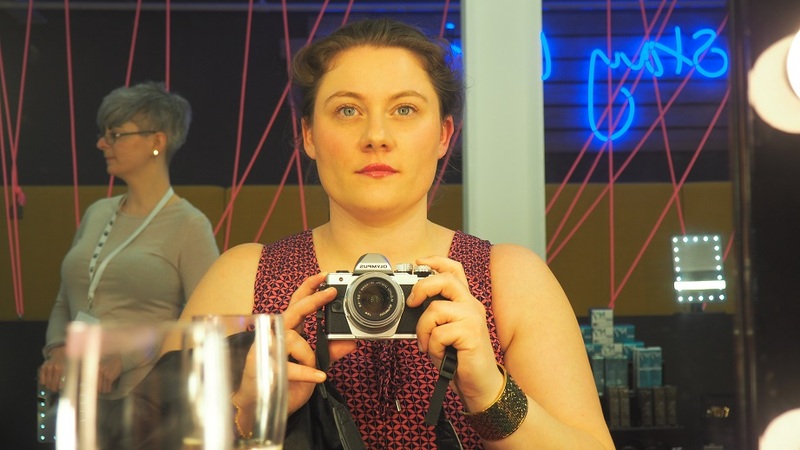 After having my makeup done, I truly felt like une star de cinéma! A bit of mascara or some new clothes can make you a new woman. Bien sûr, that’s it not all. Being positive in your mind is also primordial. But it’s a start! Feeling good in your skin starts with a bit of pampering! Feeling like starting your own business? Build it up step by step: it sometimes takes a while to build an empire but it is worth it! Carrie Longton told us that for the first 6 years, Mumsnet was not making profits. And look at it now! It is such a success, the reference for many bloggers and mummies! Be bold: some people might tell you that your idea is crazy but if you feel that you have THE ONE, go fo it! The same people will look at you with envy when you are the success of the year. Yeah, just that; let’s be modest! Have a backup plan: you have a family and it might take a while to make money. So maybe do it progressively. Don’t quit your job overnight. Be flexible and see your business growing. Start working 4 days a week and use the rest of time on your company. When it is big, go for it!!! Fab ladies on a mission! Watch out, people! That’s it from me folks! I hope you enjoyed reading this post about how to return to work with confidence. All the ideas I listed here might not be rocking science but I think that sometimes things need to be reminded. 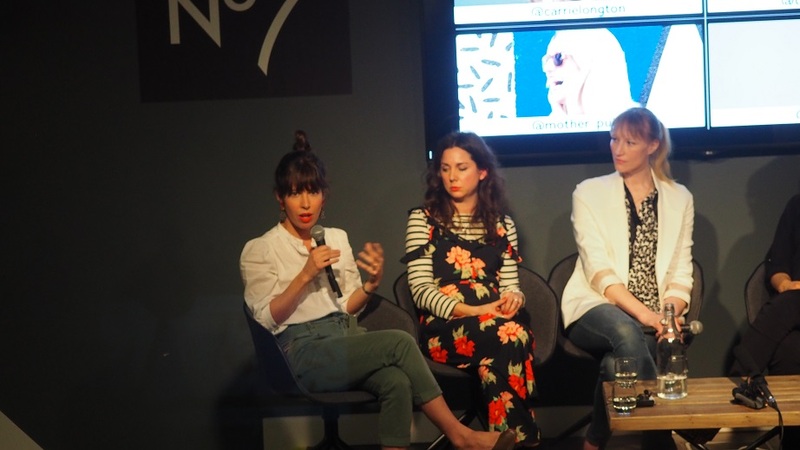 I really enjoyed attending the No7 Event with Mumsnet and Boots UK. It was so inspiring and it helped me remember that I rock it! 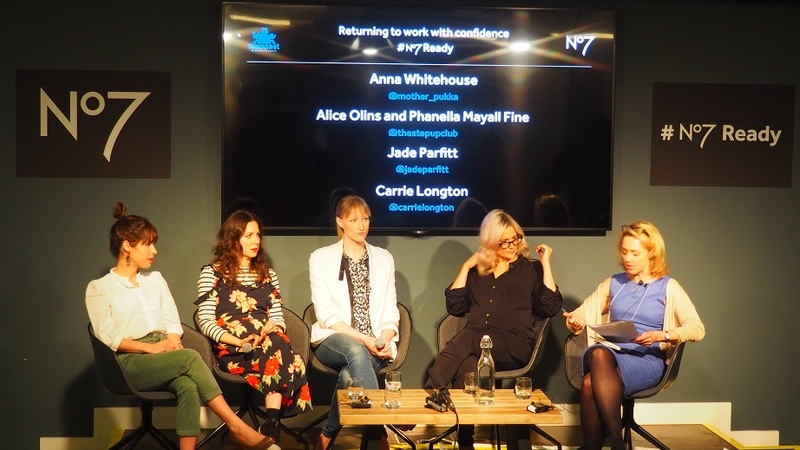 Thank you so much to Anna Whitehouse, Alice Olins, Phanella Mayall Fine, Jade Parfitt and Carrie Longton for this fabulous and inspirational talk! I reckon you gave some #girlpower to many women that night! And merci as well to Boots UK and Mumsnet for the bubbles, the lovely food and the makeup!!!! 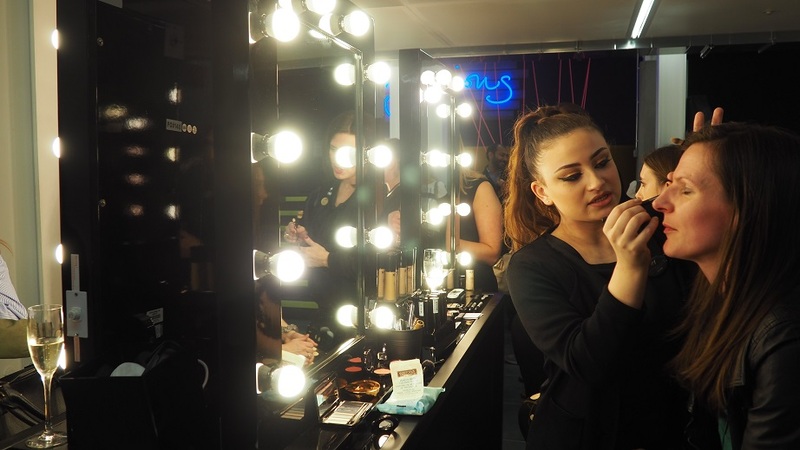 We also loved our goodie bag… Off to try the new makeup tips I learnt at the event this week! Fabulous tips, especially asking for help, we can’t do it all alone. Looks like you had a great time amongst some truly inspiring women. These are great tips! Asking for help I think is the one thing us mum’s struggle with the most. And a bit of lipstick is an amazing confidence boost.